Contains significant materials covering a wide range of topics related to forestry research and forest management practices in Central British Columbia from the 1920s to the 1980s with the bulk of the materials dating from 1924 to 1963. Includes early surveys and descriptions of the Upper Fraser area, early maps and plans of the Research Forest, and historical meteorological registers from the area. Also includes unpublished scientific reports, communications, administrative and technical reports, timber sale records, and general forestry related reports and publications. Photographs include images of the Experimental Station dating from its inception and images of the Young Men's Forestry Training Program situated at Aleza Lake in 1936. Research records include experimental plot files that contain field notebooks dating from 1928 to 1958 which note locations of the experimental plots as well as sample plots from the surrounding areas of Hutton, Penny, and Foreman. The field notebooks also record growth and mortality data of white spruce balsam from 1928 to 1958 and soil types. 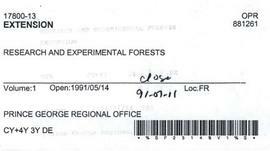 The fonds also contains some records related to the re-emergence of the Aleza Lake Research Forest (ALRF) in the 1980s and 1990s. Records arranged with the Ministry of Forests and Range Records Classification System. Special materials (photographs, maps/plans, and electronic media) as well as published reports have been described to the item level. •	See BC Forest Service photographic holdings at The Exploration Place (http://www.theexplorationplace.com/).